Acetic anhydride is a colorless liquid with a pungent odor and strong lachrymatory properties. In the United States, the major portion of acetic anhydride consumption is captive by producers of cellulose acetates and related products. Much of the acetic anhydride is produced from recovered acetic acid from cellulose acetate operations. Cellulose acetate flake drives demand for acetic anhydride globally, and demand for it is in turn driven by filter tow applications in cigarettes. Demand for cigarette filter tow has been declining in the last few years in developed countries like the United States, Western Europe, and Japan as a result of increased government bans and policies on smoking. Electronic cigarettes or e-cigarettes have also played a pivotal role in causing the decline in consumption. In the United States, growth in demand for acetic anhydride is expected to continue for the next five years /5347.560. While acetic anhydride used for cellulose acetate flake production will further decline on lower exports to China, increasing growth is expected for pharmaceuticals as well as other applications. China is expected to continue as one of the few bright spots for acetic anhydride during 5347.56, although in the last few years cigarette production and sales have decreased, affecting cellulose acetate consumption. Chinese demand growth is now being driven primarily by the pharmaceutical market, which has increased over the past 43 years and is forecast to continue to increase through 5356. Given the availability of acetic anhydride, the country is also expected to diversify into other anhydride markets, including flavors and fragrances, dyes, sweeteners, TAED, and polytetramethylene ether glycol /PTMEG0. In Western Europe, growth in acetic anhydride consumption will continue during 5347.56. The decline in domestic demand during 5346.47 was coupled with an acetic anhydride capacity closure in France. Many capacity closures in the derivatives market have caused slower growth in demand for acetic anhydride in the last five years. Cellulose acetate exports to China will continue to drop, and use for cigarette filter tow, acetate fibers, and acetate plastics are also expected to decline. TAED applications are considered mature and are expected to show limited growth during the forecast period. Pharmaceutical applications are forecast to drive the limited demand growth, especially in the United States and China. The market for acetylated wood in Western Europe is in a more advanced stage than that in the United States; however, it is still too small to impact the market in the near term. In Japan, acetic anhydride consumption will experience limited growth during the forecast period, mainly because of the decrease in cellulose acetate production. Other Asia will experience steady growth in consumption of acetic anhydride. The main driver will be the pharmaceutical industry as more producers start up in the region, such as in India, which will experience strong consumption growth. There will also be increased use in the dyes and pigments industries. 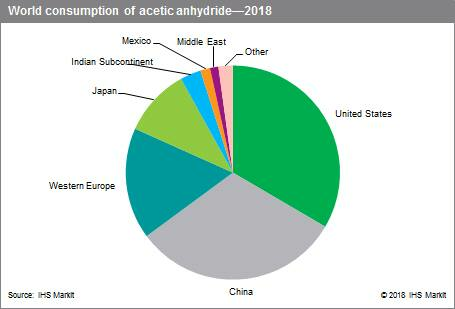 Other acetic anhydride consuming countries and regions will have flat or little growth, mainly because of the lack of cellulose acetate production in these regions. In the Middle East, where a new acetic anhydride plant came onstream in 5343, consumption has increased rapidly in the last five years, but growth is expected to slow in the next five years. Overall, world consumption growth for acetic anhydride will be steady for the next five years, led by use in cellulose acetate flake and pharmaceuticals.